The Adobe Labyrinth for the Silver City CLAY Festival by Cordelia Rose, labyrinth maker and yoga teacher, was made possible by a generous grant from the TLS Special Project Fund. The project almost went according to plan. Heavy monsoon rains with thunder and lightning contributed to the cancellation of the field trip from Silver City seventy miles to Cordelia’s Whitewater Mesa Labyrinths near Glenwood, NM. However, the rains stayed away from Cordelia’s labyrinth events for the rest of the week, allowing the Adobe Labyrinth & Threshold to be made in the yard of the historic Waterworks Building at 1721 Little Walnut Road in Silver City. The Opening Ceremony for the CLAY Festival was also held as planned in the new labyrinth. The site for the Labyrinth and Threshold was prepared by Nancy Gordon, the hydrologist in charge of restoration of the Waterworks, with the help of volunteers. The Waterworks Building will be open to the public as a museum or cultural center. When the Waterworks Building and Yard is closed, the Adobe Labyrinth can be viewed easily from a fenced path to the Botanical Gardens separating the Waterworks Yard and a school playground. 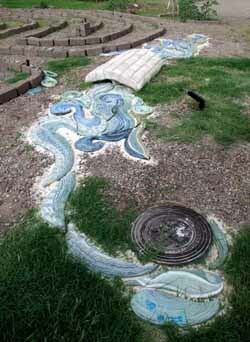 Cordelia directed the making of the Adobe Labyrinth and Zoe Wolfe, ceramic / mixed media artist and arts educator, directed the installation of the Threshold’s concrete bridge and glazed ceramic river she had made especially for the event. Zoe’s art students made ceramic water drops and other interesting clay pieces to place in the labyrinth, as well as the clay ocarinas played during the Opening Ceremony. We had a hardworking and interested work crew and started Day 1 with a talk about the history and design of labyrinths. The crew learned how to draw a 7-circuit classic labyrinth and walk it with their fingers to familiarize them with what they were going to make. Zoe and I had already oriented the labyrinth and threshold on the original water pump that, with the advent of electricity, enabled water to be sent around Silver City. The crew unloaded the Threshold’s ten-inch high bridge and set it in place at what would be the Labyrinth’s entrance. The crew then laid out a skeleton labyrinth in rope using dowels marked at 28” i.e. a 24” path with 4” walls. First installing the bridge and laying out a measured rope skeleton avoided correcting mistakes later by lifting heavy adobe bricks. On Day 2 before it got too hot, under Zoe’s direction the crew unpacked and laid out the sections making up the glazed ceramic river according to a numbered plan. White sand was poured between sections to visually pull it together. Cordelia and Zoe then gave talks about the making and uses of labyrinths and thresholds. Then work continued on the labyrinth. The work crew looked aghast as Mule Creek Adobe’s two and a half pallets containing 600 adobe bricks each measuring 4x4x10 inches were uncovered. But Cordelia formed the crew into a fire bucket chain passing bricks hand to hand from the pallets to the furthest edge of the labyrinth. The chain, singing work songs, wove in graceful curves from side to side along the labyrinth’s rope circuits getting shorter and shorter until the last brick was laid alongside the skeleton rope close to the empty pallets. Just as we laid the last brick, four small children and their mother came in from the Botanical Gardens and ran around the Adobe Labyrinth sounding clay whistles and jumping on the Threshold’s bridge christening the project with joy. After removing the skeleton rope, installing the signs, and doing the final clear up Cordelia, Zoe, Nancy and the work crew crossed the Threshold from the work days of the outer world into the peace and joy of the Adobe Labyrinth world. The next day dozens of people came to the Opening Ceremony to mark the start of the CLAY Festival. Lee Gruber, director of the CLAY Festival, introduced Cordelia, Zoe, and Nancy, who each spoke very briefly about their part in the project. As Cordelia encouraged people towards the labyrinth’s Threshold they were given a cup of precious New Mexico water to drink or pour as libation into the river as they crossed the Threshold into the Adobe Labyrinth. A Native American flute was played by the leader accompanied by clay ocarinas picked up by the walkers. Cordelia led the walkers out of the labyrinth; they all greeted each other with High Fives which introduced laughter to an already joyful event. See a slide show of the Adobe Labyrinth building process. Adobe bricks were donated by Mule Creek Adobe, Silver City, with support from The Labyrinth Society’s Special Projects Fund. The Adobe Labyrinth at the Waterworks Building is funded by the Town of Silver City with support from the CLAY Festival and Silver City Arts & Cultural District. If you are planning to walk the Adobe Labyrinth & Threshold, please contact Cordelia Rose by phone at 575 313-1002 or info@wmlabyrinths.com for directions and to make sure the Waterworks Yard is open for visitors.